If your house is like mine then sometime over the next month or so you will host family and/or friends for an overnight stay! I love hosting here at StoneGable. And I want my guests to feel like we could not wait until they got here! It’s so important to make guests feel wanted, welcomed and comfortable in our homes, especially if they are staying an overnight or two! 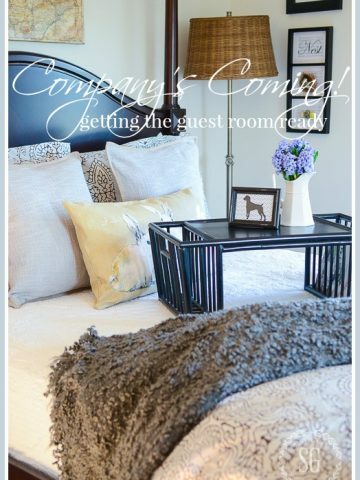 So here are 10 simple, kind, doable things to get your guest room ready for friends and family that are staying with you over the holidays! 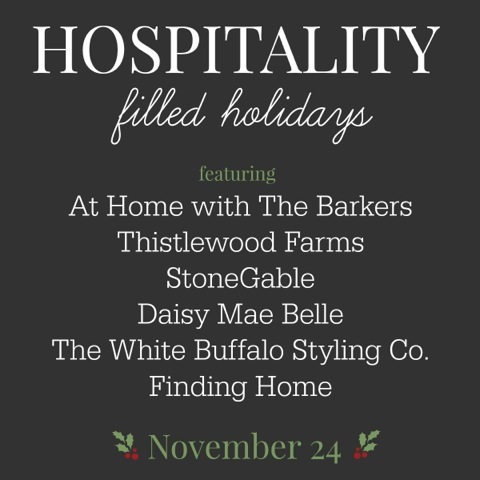 I am so excited to be participating in… HOSPITALITY FILLED HOLIDAYS. Please visit the bottom of this post to see all the wonderful, creative, Christmas idea these talented bloggers have for you! Our home is at its best when it’s full of overnight guests. StoneGable takes on a life of its own, that’s for sure!!! This is our GABLE GUEST ROOM. It’s one of four guest rooms here at StoneGable.It is the smallest and certainly the most feminine. This room has such a cozy feeling with it’s high ceiling, big window and pitched walls. I like to say it is a room that envelopes you! Most of the pieces here are antiques or have been in my family. The Gable Room is decorated and ready for guest this weekend. 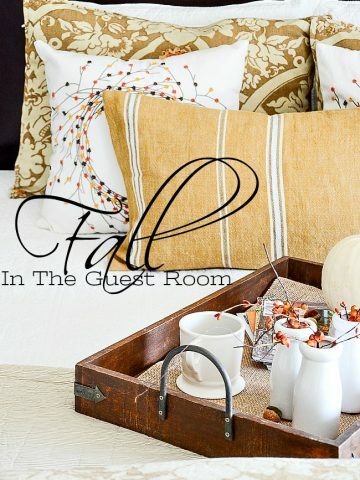 Here are some of my favorite ways to make guest feel at home away from home. Let’s get past the obvious… clean room, clean linens, comfy bed and look at little ways to make our guest feel welcomed! 1. Lightly decorate a guest room for the holiday. 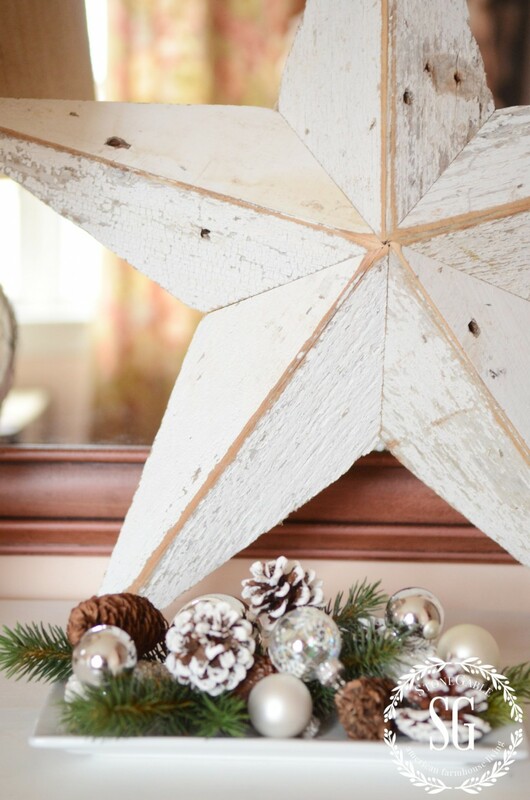 Nothing says I’ve been expecting you like making the effort to bring a little bit of Christmas into a guest’s room! But don’t overdo it! You don’t need to dump the whole sleigh of decorations in the guest room. A little goes a long way. We don’t want to overwhelm our guests! 2. Give guests space to move around in a guest room. We don’t need a triple dresser, chest of drawers, gigantic bed, chairs, tables and night stands in one room… unless it’s palatial! Opt for a nice modest bed, chest of drawers and maybe a small table and or chair. Guests will come with lots of “STUFF”and luggage and presents and animals and they will need all the extra space in a guest room you can give them. Again, less done beautifully is best! 3. Clean out the closet in the guest room. Take everything out. I know this might be a hard thing for many of us to do. It seems like such a waste of usable and valuable space. But your guests will love you for it! Your guest will have more freedom to hang up their clothes and stash away their suitcases. I also keep extra blankets and a fan and a small electric heater on the top shelf of the closet for our guest’s comfort. 4. While we are cleaning out… clean out the dresser drawers and put some pretty drawer liner in the bottom of them. I keep towels in the bottom drawer for our guests, but the rest of the drawers are for them to use. 6. Have a box with personal, hygiene and incidental items in the guest room so your guest don’t have to bother you for something they forgot. I let my guests know beforehand that they can find this box in the basket under the table. Don’t forget to add tissues, ear plugs and an alarm clock. 7. It’s a good idea to supply your guest with a few bottles of water and some snacks. Sometimes, guests need a break from all the Christmas cheer going on and want to regroup in their room. Have it ready with a nibble or two. I keep a small dish of our local (and famous) Wilbur chocolate buds near the bed on a table. I usually have to refill the dish! 8. 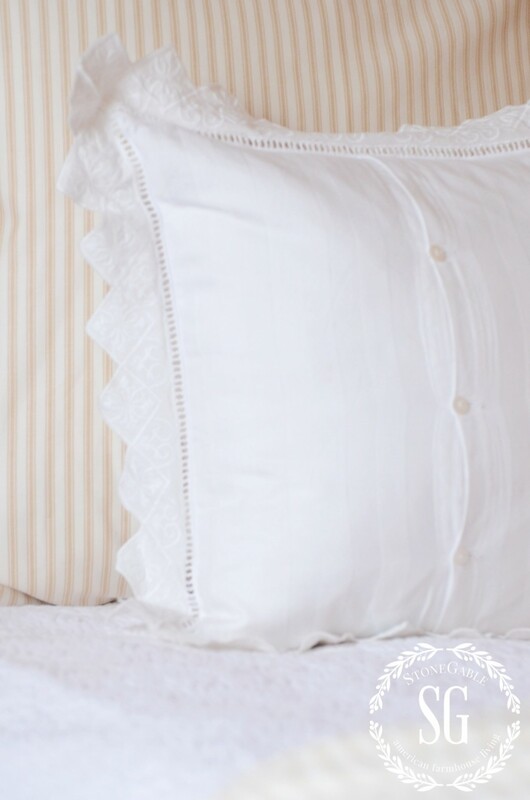 Don’t you love slipping onto a well made bed with beautiful linens? Our guests will too! Make sure you make up a cozy bed with nice sheets and blankets and covers. I keep a fluffy duvet at the end of our guest beds all year round! 9. Fluff the pillows! I’ve slept on my share of old, flat, tired pillows in other’s homes! If you don’t like sleeping on them either will your guests. 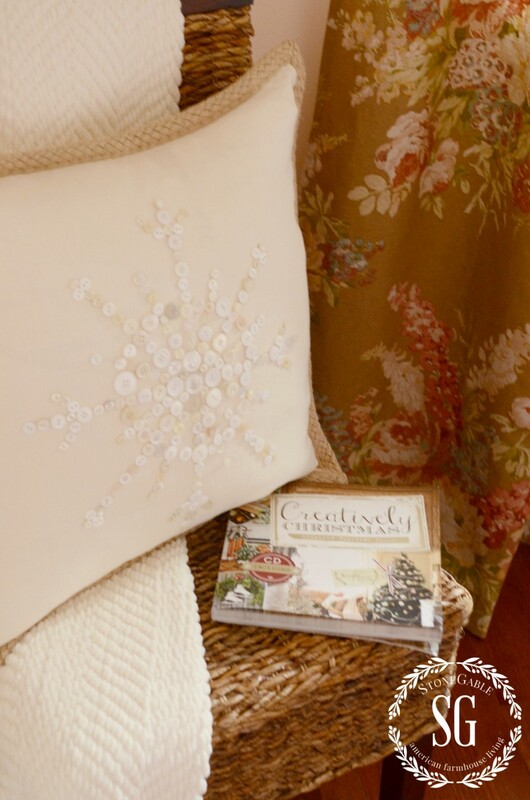 There are fluffy, inexpensive pillows on the market so there is no reason to give guest our cast-offs! I buy both down and poly filled and offer both to guest. 10. Ask your guests beforehand if they have any special needs, allergies or accommodations. Just asking shows how much you care! How about you? 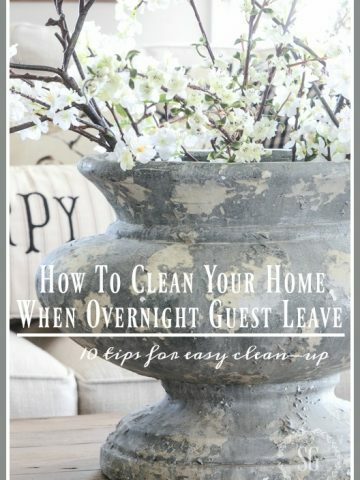 I bet you have lots of wonderful tips for hosting overnight guests over the holidays… please share right here! Remember to pin this to your CHRISTMAS or DECOR Pinterest boards. 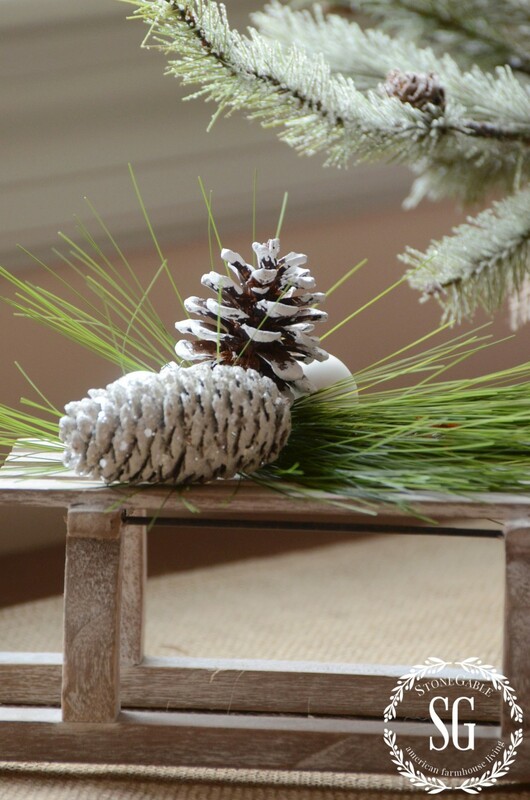 You can follow me HERE and see my CHRISTMAS board… full of inspiring pins just for you! COMPANY’S COMING… GETTING THE GUEST ROOM READY! I used many of your ideas when preparing for guests this pat Thanksgiving and Christmas. 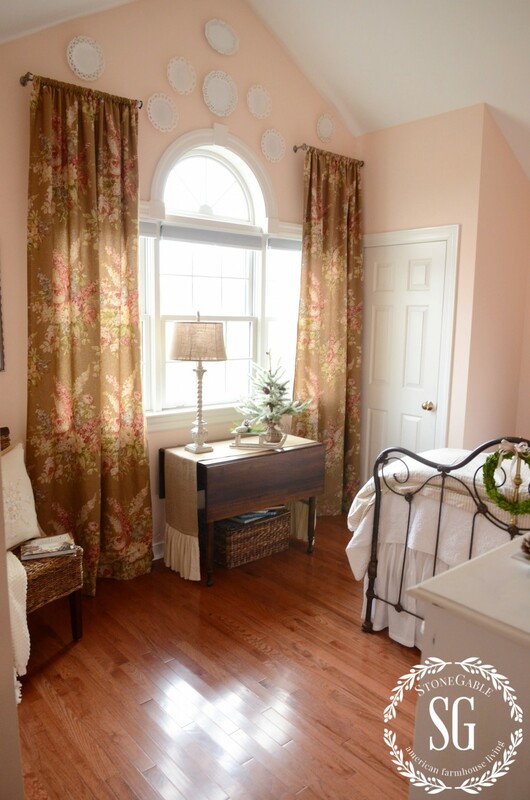 I was just rereading this post, love this little room, and noticed you said it was “one of four guest rooms here at StoneGable.” So there’s the gable room, your daughter’s and your son’s rooms. Just out of curiosity, what is the fourth room? I’m always interested in seeing more; your spaces are always so nice. We have a guest suite as well. It also is a gable room. It has it’s own bathroom and is a bit larger than a normal bedroom. It has with own set of stairs from the ground floor. We have had many people live there with us and it is in need of a complete makeover. It’s on our list for renno in 2016. I am thinking of renting it out on air B&B when it is done. Great tips. Thank you again. I remember Wilbur buds. They were my mom’s favorite. We always stopped by the chocolate factory on our many trips to Lancaster and brought home lots of goodies. 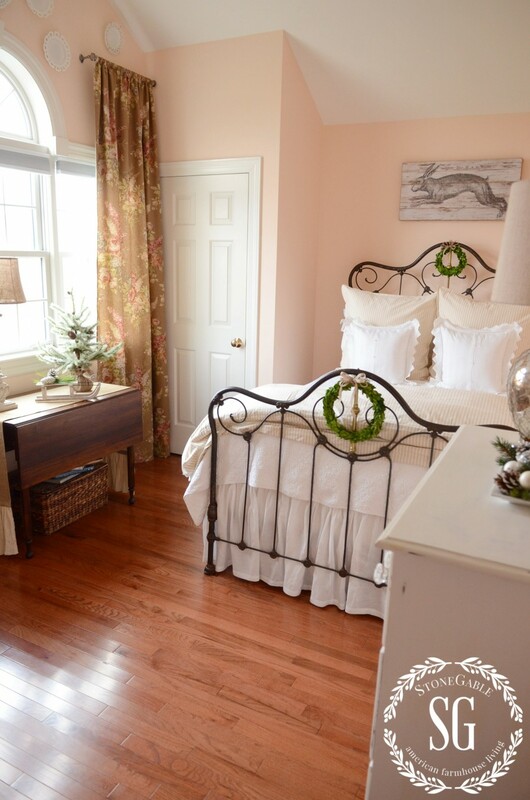 You are always the perfect hostess…the guest room is exquisite and wonderful haven for your guests! Hi Yvonne, Love the room! I love everything you do!! Can you tell me where you got the snowflake pillow and the lace one with the buttons, thank you lady! Hi Rebecca, this bed came from a local store about 6 years ago and is a Martha Stewart brand. It’s as solid as a rock! Thank you so much for taking the time to respond. I love everything about your blog, admire your strong faith and look forward to each of your posts. I live in Northern Alberta, Canada, and I check your blog daily. Thank you for all the inspiration and for always living out your faith in what you write! My daughter loves the wall colour in your guest room, and I was wondering if you could give us the name as we are updating her room. Thank you so very much! Hi Karen, I am so so sorry but neither me or my hubby remember the color. For some reason, Creamy White by Valspar rings a bell. See if they have something by that color. I am just astonished that you took the time to answer my inquiry so quickly! Thank you, and God bless you! What a beautiful guest room! 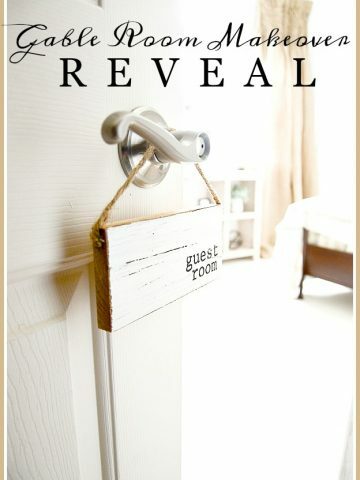 I am currently redoing a bedroom for a guest room and having a hard time finding the right wall color, as soon as I opened this link I fell in love with the whole room. Can you give the color? Any guest should feel absolutely honored to stay in this room. I love love love your décor. I also leave a local map! But something I love, a luggage rack. They fold up when not in use, in the closet! Also when we help them to their room, we put the luggage on the rack and the visitors know what it is for. It also saves the bedspread from getting snags! Lovely guest room, cozy and inviting! I have two white bath robes on padded hangers in the closet for their use. Always clean and on the new side. This is the one thing I get the most compliments on. I like to add a few water bottles and packged cookies for a treat. Yes, great advice to leave the guests room for THEIR stuff!! Yes, clear out that closet – I keep extra blankets and pillows in my guest room, and lots of empty hangers in the closet ready for a guest’s clothes. I cannot tell you how often I have stayed with friends who have every surface covered with pictures of their family, or other bric-a-brac. One thing I would add, pack an overnight case and stay in your own guest room overnight. It will tell you where the problems are that your guests won’t tell you – like the ceiling fan that buzzes, the air conditioner that wakes you up in the middle of the night, or other issues. I keep guest things in a basket too – and extra toothbrushes and similar items in the guest bath. You have a lovely home!! I LOVE that bunny print over the bed!!!!!!!! Where did you find it? 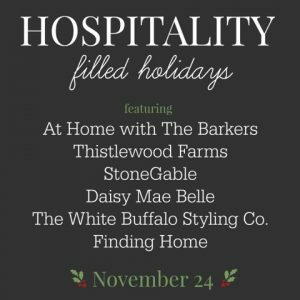 You are the definition of hospitality friend! Beautiful room and great tips!!! Guests will appreciate your wifi code. Leave it by the bed on a pretty card. Welcome!! Attention to Detail is So Important and You have it All. I’m having the same problem. It takes forever to load up the pictures and it also won’t make the link to Pinterest correctly. As a matter of fact, I couldn’t even link up from the email; had to do it directly from the internet myself. Beautiful room, Yvonne and I love the wall color. Not sure anyone else is having this problem, but the pictures are taking forever to load and they didn’t use to. They are still loading while I write this comment.